The study of human cognitive processes provides insight into why we act or react and can help us predict future behaviors. 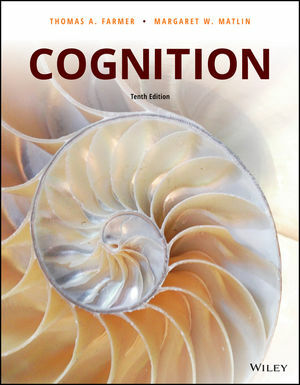 In Cognition, authors Thomas Farmer and Margaret Matlin present an engaging and highly relatable examination of how these processes work, and how they are responsible for the way we perceive and interpret the world around us. Broad in scope without sacrificing depth of detail, this text emphasizes the link between conceptual cognitive psychology and real-world experience; case studies, current trends, and historical perspectives merge to provide a comprehensive understanding of core principles and theories. This new Tenth Edition has been updated to reflect the latest research, technology, and thinking, with more in-depth coverage of topics rising to prominence in the field’s current knowledge base. Expanded explanations balance classical and contemporary approaches to specific topics, while additional experiments and an emphasis on methodology and experimental design are included to facilitate a greater appreciation of the field’s rigorous research.